In the summer of 2009, the Population Research Institute went out on a limb. It wasn’t a very long cartoon, only about a minute and a half—and the animation was deliberately minimalist. But it was clever, quick, and easy to watch. The music was original, cool, and jazzily low-key. It avoided politics entirely, choosing instead to focus on widely accepted science and math. It was entitled “Overpopulation: The Making Of A Myth,” and it was just a simple discussion about the myth of overpopulation. And most importantly, it was funny. And the gamble paid off. According to PRI’s Colin Mason, within a week the video had gone completely viral. The series became a sensation among people interested in the overpopulation topic—and even among those who weren’t. With each episode, it became more and more popular, placing it among the most highly watched pro-life video series ever created … and carving out a place for PRI as one of the highest-ranked non-profit channels on YouTube. The numbers alone tell the story. Overall, the series has received more than 1.1 million views (the first episode still holds the record with 380,000 and counting). The videos are ferociously discussed on YouTube (there are over 14,000 comments), and off YouTube (the Facebook page has over 5,000 members). Not only that, but references to the series have worked their way into dozens of internet message boards, discussion threads, blogs and web sites … including Wikipedia. “The fight against the myth of overpopulation does not have to be a bare-knuckled brawl,” says Steven Mosher, PRI’s president. “These videos are funny and easy to digest, the very opposite of Al Gore’s prognostications on the ‘dangers’ of too many people. Our viewers end up considering the science that supports our pro-people position, often for the very first time. 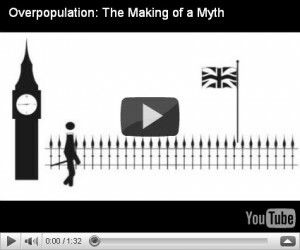 All of the videos, as well as Overpopulation Is A Myth T-shirts, can be found at www.overpopulationisamyth.com.